[Adam] sent in this cool project. He has modified a Polaroid J66 camera to use modern film. Most of the initial modifications look fairly simple, but things get a little more complicated when they also convert it to a fully manual camera. There is a section that explains a neat little trick of using a cheap solar panel attached to your computer sound card to figure out what ISO the camera is shooting at. using a solar panel works well, as they are sensitive to mid red light which neatly matches the peak response of many new films. Interestingly you can now get colour sensors which do the same job but with 12 bit accuracy. What is this “film” you speak of???? Why dosn’t some hacker come up with a digital film replacement, lots of old film cameras out there just going to waste. @osgeld – you now know why the Japanese camera manufacturing industry ate the U.S. companies alive. You need to correct the article, he didn’t use a solar panel to detect ISO, he used it to determine shutter speed. ISO is a measurement of film sensitivity to light. The shutter is what determines the amount of light that hits the film. That and the aperture of course. Finding the ISO of a film camera is no more difficult than simply looking at what film you are using. It’s all right there. Sometimes its even in the name like Tri-X 400 is 400 ISO film. 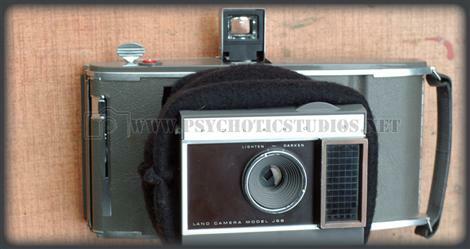 I have an original Polaroid land camera. It takes great pictures when i put some paper film min it. 32gb still aren’t available to consumers sadly. Wont be much longer now though. Within this year. This is cool, but 9×12 films and 35mm films seem to be equally “modern” these days ;) 9×12 is still being manufactured, at least in B&W. I too have an old Land Camera that I’d like to use. I’ll have to give the paper film a go. Any info on this online? Well he bought it, so he had to do something with it:) An interesting project. BTW; film is both an image sensor and image storage, AFIK flash memory has yet to match that. Give Caleb a break on the ISO thing, he is only one person with way too many editors. Given how much stuff they have to wade through to have something to report, a mis-statement is going to creep through once in awhile.